The program emulates the HD61700 microprocessor and uses the ROM dump from the original calculator, therefore it should function almost exactly like the real one. It works on PC-compatible machines with Microsoft Windows operating system. The main purpose of creating this program was the verification of the correctness of the reconstructed processor's internal ROM image, and to have a tool helping by the analysis of the ROM disassembly. Usage: Replace the files rom1.bin and face.bmp in the directory where the program was installed. The updated files ram0.bin, ram1.bin and register.bin are saved when the program is terminated. If they weren't found, they will be created. In such case the memory has to be initialised with the New All button. To press two keys simultaneously, both the PC keyboard and the mouse must be used. For example to type the ANGLE keyword either click on the [F] key on the screen and press the L on the PC keyboard, or hold the Ctrl key on the PC keyboard and click on the L key on the screen. A mouse click on the LCD area simulates the touch-screen function. The application can be closed by clicking on the cover lock on the upper-right edge of the form. The top line in the register box shows the state of the upper four bits of the Flag register. They can be modified as well. Pressing the button [Run] in the Single step group box executes a single machine code instruction without servicing of the interrupts. 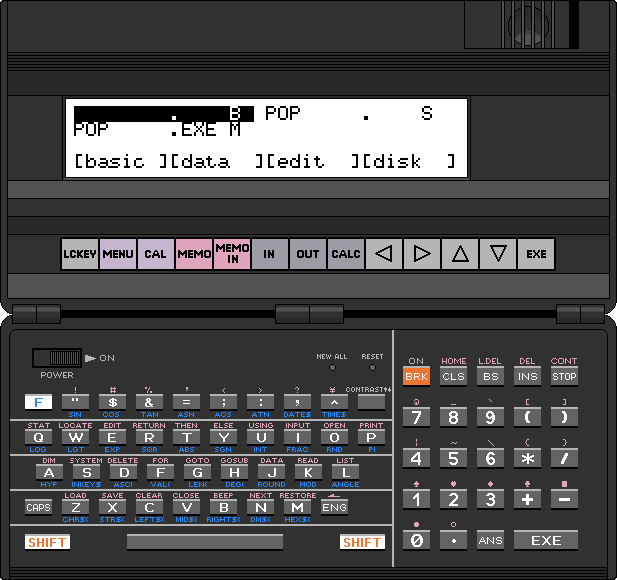 Some parameters of the emulator can be customised by editing the pb1000.ini file with any text editor. This setting specifies the Option Code of the interface unit. The value should be either 255 (for stand-alone operation without any peripheral devices) or 85 (to be used with the MD-100 Floppy Disk Drive emulator). This setting specifies the IP address of the FDD server host, usually of the local computer. This setting specifies the port on the FDD server that the emulated calculator will connect to. The sound isn't supported yet. This utility transfers files between the PC and the ramdisk area of the RAM image used by the emulator. The ramdisk filenames are eight characters long plus three characters for a file extension. They are case sensitive and can contain characters not allowed on the PC. Ramdisk patterns containing wildcards should be enclosed in quotes to avoid their expansion by the shell. - list only selected files: ramtrans dir "*.BAS"
- hex dump of all files with an extension .BIN: ramtrans type -b "*.BIN"
- multiple files to the local directory: ramtrans mget "P*.BAS"
- multiple files to a specified PC directory (after the -d option): ramtrans.exe mget -d c:\windows\temp\ "*.BIN"
Similar to put, but copies multiple files. Deletes files on the ramdisk. Renames files on the ramdisk. Ignore the case of ramdisk file(s). It is convenient to select this option when transferring files to the ramdisk. Select type to X (B, M, S or hex). S - Sequential files, including MEMO files, assembly source files, files loaded via RS-232C and BASIC programs saved with SAVE,A. The contents is ASCII text with CR+LF delimiters, terminated by Ctrl-Z. M - Machine code files (for example created by the built-in assembler) and binary files (for example created with BSAVE). B - BASIC programs in internal representation. It is important to select proper type when transferring files to the ramdisk. This option should be selected when transferring tokenized BASIC programs and binary files. Note: the ramtrans utility doesn't preserve the information about the destination address and the start address of machine code programs. Such task requires appropriate file formats (for example PBF) along with corresponding loaders (for example PBFTOBIN provided with the HD61 assembler). This option should be selected to transfer PC text files, because it ensures correct line termination (CR+LF) and file termination (Ctrl-Z). It's also suitable for machine code programs in PBF format. No updates are written to the RAM image, useful for testing. 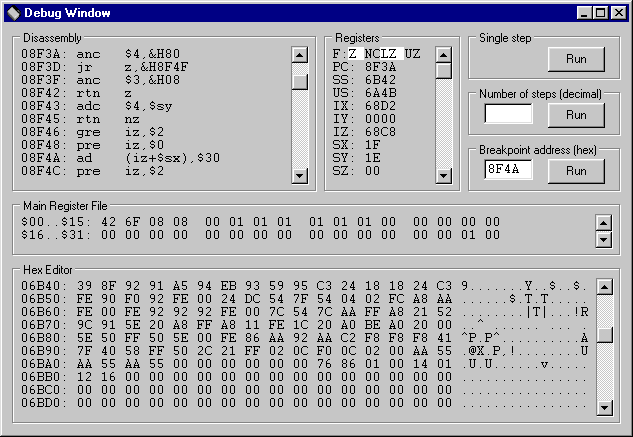 The program is an adaptation of the md100 utility written by Marcus von Cube, which performs similar operations, but on an MD-100 floppy disk or an image thereof.